Is your company constantly having issues between resources, project managers and teams across all of your business departments? Wondering if there is a chance to gain control of your projects? FinancialForce Professional Services Automation (PSA) is the most effective services business software across your entire enterprise. 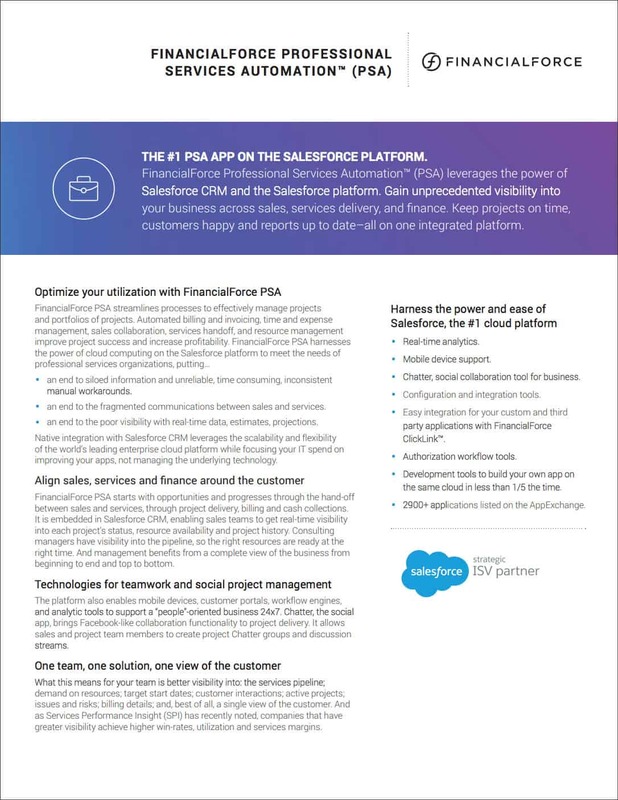 FinancialForce PSA is built on the Salesforce platform, allowing your business to manage your services projects all on a single cloud-based platform. Whether you are looking to break down silos and work in unison, or you need visibility between your sales and services you can count on FinancialForce PSA. If you are wondering how FinancialForce PSA works for your business, download the full PSA datasheet.